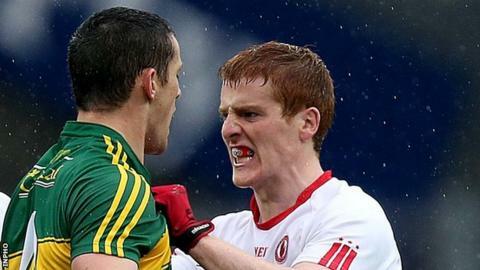 Seventeen Ulster footballers have been nominated for this year's Allstars. Tyrone have seven in the 45 with Sean and Colm Cavanagh included with Ronan McNamee, Ronan McNabb, Peter Harte, Mattie Donnelly and Cathal McCarron. Ulster champions Monaghan have four: Conor McManus, Rory Beggan, Karl O'Connell and Vinny Corey. Donegal's five contenders are Paul Durcan, Neil Gallagher, Michael Murphy, Ryan McHugh and Frank McGlynn while Fermanagh's Sean Quigley is nominated. The beaten Ulster finalists's edge over Monaghan in the nominations will be a talking point with Durcan, Gallagher and Murphy all included after earning Allstar awards 12 months ago. Last year's Young Player of the Year McHugh is again in contention for that award along with Mayo's Diarmuid O'Connor and Monaghan's Ryan Wylie. All-Ireland champions Dublin lead the way with 11 nominees with goalkeeper Stephen Cluxton, Paul Flynn, Denis Bastick and Dean Rock the only members of their Sam Maguire Cup-winning final line-up not to make the 45. The Dubs, who also won this year's League title, supply the three contenders for the overall Footballer of the Year award with Bernard Brogan, Jack McCaffrey and Philly McMahon the hopefuls. Beaten All-Ireland finalists Kerry have eight nominees with impressive corner-back Shane Enright, Donnchadh Walsh and reigning Footballer of the Year James O'Donoghue among their contenders. Laois forward Donie Kingston and Westmeath's Kieran Martin are also among the nominees. Sean Cavanagh's nomination means he will have the chance to join Peter Canavan in receiving a sixth Allstar award. Cavanagh's brother Colm is nominated for the first time along with McNamee, Harte and McNabb. Frank McGlynn (Donegal), Ryan McHugh (Donegal), James McCarthy (Dublin), Cian O'Sullivan (Dublin), Rory O'Carroll (Dublin), Jonny Cooper (Dublin), Jack McCaffrey (Dublin), Philly McMahon (Dublin), Shane Enright (Kerry), Jonathan Lyne (Kerry), Keith Higgins (Mayo), Lee Keegan (Mayo), Chris Barrett (Mayo), Vinny Corey (Monaghan), Karl O'Connell (Monaghan), Cathal McCarron (Tyrone), Ronan McNamee (Tyrone), Ronan McNabb (Tyrone). Bernard Brogan (Dublin), Jack McCaffrey (Dublin), Philly McMahon (Dublin). Ryan McHugh (Donegal), Diarmuid O'Connor (Mayo), Ryan Wylie (Monaghan).